You can be confident that your loved one will be treated as an individual with a unique background and perspective. Our memory care unit’s services and care designed specifically for those living with memory loss and cognitive deficits who require a higher level of specialized care. 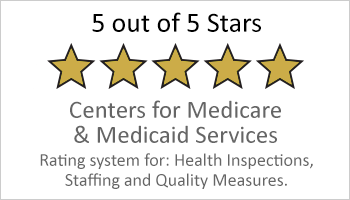 Our 24-hour in-house care team, along with ancillary providers such as Geri-psych services and hospice agencies, provide guidance, assistance and both custodial and skilled care services as needed to maintain dignity and achieve the best quality of life. Our specially trained care teams provide compassionate supervision, support, and assistance under the direction of our full-time Program Director, Memory Care Unit Manager and Charge Nurse. Not only do our caregivers understand the unique challenges of caring for dementia patients, but our entire staff has completed the CMS approved Hand in Hand Dementia Care program for person-centered and habilitation care approaches and interactions. Every staff member your loved one may encounter – from housekeeping and dietary to certified nursing assistants and nurses – understands successful strategies for interacting with memory care patients. 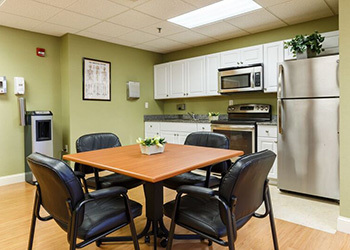 We’ve designed our memory care unit to maximize successful days. Recognizing that residents with dementia are particularly sensitive to their environment, we pay careful attention to environmental details, striving for a secure, supportive setting. Activities are developed based on the residents’ level of participation, pace, special interest, and backgrounds. Participation is always voluntary and dual and parallel activity programs take place within the unit when space allows. Individual therapeutic programming is made available when appropriate for residents who are unable to join in group activities as well. Download a pdf of our April activity calendar for our memory care residents. Download a pdf of our April evening activities for our memory care residents.